How did our solar system come into being? This question is being explored by a team of geoscience and physics students, as well as scientists, engineers and programmers in Frankfurt. Experimental Chondrule Formation aboard the ISS (EXCISS) is the name of the project which began its space mission on 17 November in a Cygnus transporter aboard the Antares rocket. It left the space station on Wallops Island, Virginia (USA) and has now arrived at the International Space Station. 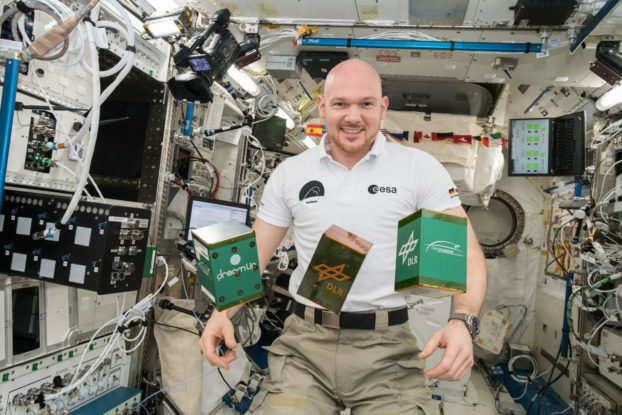 Alexander Gerst aboard the ISS with the three experiments in the space competition. Less than two years ago, a team of students from Frankfurt’s Goethe University was formed to come up with an experiment to submit to the space competition (see info box). The project focused on the creation of chondrules, small spheres found in many meteorites that are considered the building blocks of the universe. Despite extensive research efforts, it remains unclear how these small spheres are created. One popular theory claims that flashes heated up the dust particles in the early years of the solar system so much that they melted to form chondrules. The team wanted to find out if this is true by performing an experiment in space under realistic conditions. It proved difficult to implement the technical aspects of the project. The experiments must fit into a 10 x 10 x 15 cm aluminum box – a real challenge when you have complex apparatus on your hands. In addition to the control and supply units, the high-voltage unit used to generate the flash had to be stored in the box, alongside the specimen chamber; a camera and an optic; a type of miniature microscope used to visualize the dust particles using the camera. One of the critical components of the experiment is the optic, which is used to observe the dust particles. This is the only way of directly collecting data on the ISS. During their search for a suitable optic able to withstand the extreme requirements of this unique environment, the students found what they needed at ZEISS. Once the framework conditions had been defined, ZEISS employees identified a suitable optic. The optical components were provided twice to the students from Frankfurt, once for the space model and once for the ground model. “The experiment would not have been possible without such generous support,” stressed Professor Frank Brenker, who oversaw the project team. One of the first images that the team in Frankfurt received from the International Space Station (ISS). 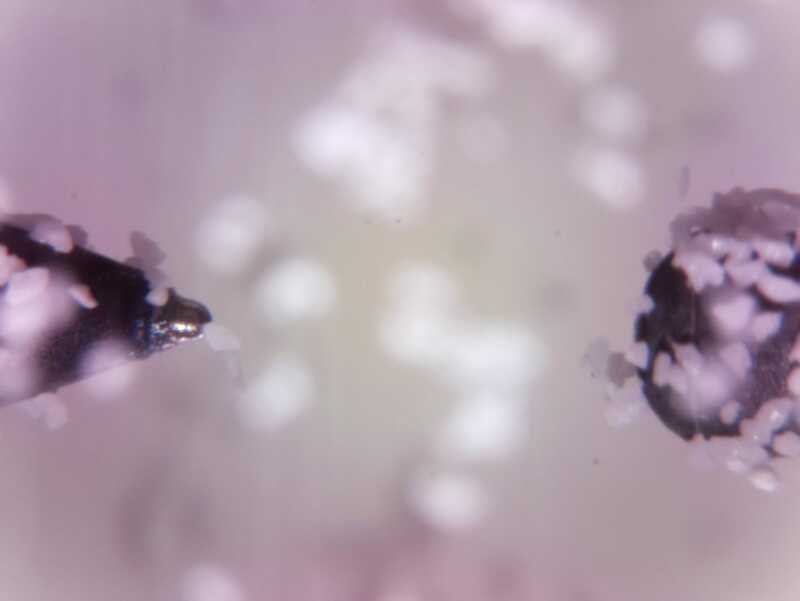 It shows the two electrodes and the dust particles. The experiment is scheduled to be performed at the space station until the end of 2018. The samples will then be examined at the Goethe University using modern analytical methods in order to gain insights into how our solar system came into being.